Saturday night’s Pics of the Day was one of “06880”‘s most special — and most commented on. The photo s– sent by a reader who did not identify him or herself — showed a 3-wheeler. In front of the pedals sat a wooden structure, filled with books. It was painted pink — just like the old Remarkable Book Shop. More remarkably, the front featured the beloved store’s dancing man logo. The photos were taken in and around Compo Beach. Readers loved it. But no one knew the back story. It started with George, although really, it started with the Remarkable Book Shop. Ever since I moved to Westport almost 18 years ago, everyone has told me that I would have loved the Remarkable Book Shop. Esther and Sidney Kramer were neighbors of ours, and I’ve harbored a secret fantasy of re-opening the bright pink bookshop for years. Which brings me to George: a cargo tricycle we bought from neighbors of ours at the beach about 12 years ago. It seemed like a great idea at the time, a way to transport picnics and children back and forth to the beach, but those children are now teenagers, and George has languished in our garage for years. More recently, I found myself obsessed with Little Free Libraries. The Little Free Library is a non-profit organization founded in the 1980’s to encourage people to read, and to bring communities together. Usually, people build them at the end of their driveways, giving away free books, bringing strangers together, chatting about books. As a novelist who created the Facebook group Westport Front Porch for exactly that reason — to bring a sense of community back — and as an avid reader, I had always wanted a little free library. Also, my house is threatening to topple over with the piles of books everywhere. But I live on a small private street, and suspected my neighbors might not be so happy with an influx of readers coming over. A mobile Little Free Library suddenly seemed an excellent idea, one that could travel around the beach and bring a bit of happy nostalgia to our town, for who doesn’t feel good when they remember the Remarkable Book Shop? I found a wonderful new Staples graduate, Ryan Peterson, to rebuild George and transform him into the bookshop. I downloaded pictures of the store for him, and with my husband Ian Warburg, who grew up here and has so many happy memories of the bookstore, designed the cart as a double-sided library where people can take home free books. I was ready to paint the sign myself, but realized that Miggs Burroughs would do a much better job. I sent him an email asking for his help with a secret project, with no idea that his mother, Esta Burroughs, worked at the book shop from the day it opened until the day it closed. (How remarkable is that?!) Miggs was thrilled, and painted both the sign and the instantly recognizable dancing man. We have loved parking the Remarkable Bookcycle (pronounced bicycle!) by the beach this weekend, and seeing the smiles on people’s faces. At some point soon, we’ll have a website set up with news of how to donate books. In the meantime, look for the Remarkable Bookcycle around Compo, raise your glasses to the spirits of Sidney and Esther Kramer and Esta Burroughs, and don’t forget to stroke Heathcliff the cat while you’re picking out your book. Yes, there’s even a Heathcliff the cat tucked in amongst the books in the Remarkable Bookcycle! … and takes an inaugural ride, along Compo Beach Road. This entry was posted in Beach, Downtown, Looking back, Media, People, Totally random, Westport life and tagged Esta Burroughs, Esther Kramer, Ian Warburg, Jane Green, Miggs Burroughs, Remarkable Book Shop, Sidney Kramer. Bookmark the permalink. That is amazing! Thank You Jane Green and all the other volunteers to help bring this beautiful bookstore back to life in Westport. It was a special bookstore for those of us who lived here and everyone was devastated when it closed. This is a really special way to bring it back to life! Thank you! I look forward to seeing it in town and donating books to the mobile remarkable bookstore!!! Wonderful and inspirational! I can see a Little Free Library in my future! Thanks for the backstory, Jane Green you inspire me! Very cool! I LOVE Jane Green’s books and have read every single one, some more then once! This is such a sweet story. I did move away from Westport after my Dad Gerry Turner passed away, but love keeping in touch through this blog of Dans. Thanks for posting this story and giving me a big smile Dan! Wonderful! Ready to donate our used beach reads, including several written by Jane! Jane is a treasure. Absolutely love this story and her passion. Long live the her Remarkable Little Free Library! Love this…as much as I loved the Remarkable when living in Westport in the ’70’s. I love reading about all these “free little libraries” around town. For that reason I wanted to be sure everyone knows about the little library at the Westport Train Station. For several years a crew of 10 volunteers have been stocking a carousel of books for people to enjoy while riding on the train. Having to replenish the books so often certainly is an indication of the appreciation of the riders. Yet, it doesn’t just have to be commuters, it’s open for everyone’s enjoyment! Thank you for the crew’s effort who found another opportunity to recycle the many books that are donated to our Library. I can’t resist bragging rights on this: I was the person who actually painted the Remarkable Book Store pink as a summer job while I was a student at Staples (class of ’64). This is my new favorite Westport story! Cheers to Jane, Miggs, and volunteers for making this happen. 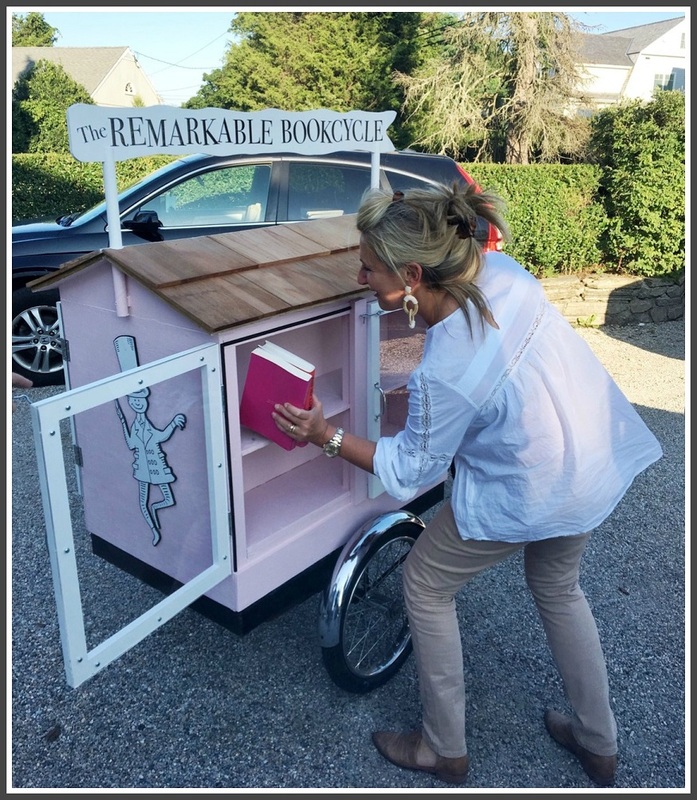 Can’t wait to see the Remarkable Bookcycle in real life! This was one of the happiest posts for the summer, heck maybe of all time! Seeing it put a smile on my face and brought back memories of that lovely store and its customers. We really have lost some great Westport icons. 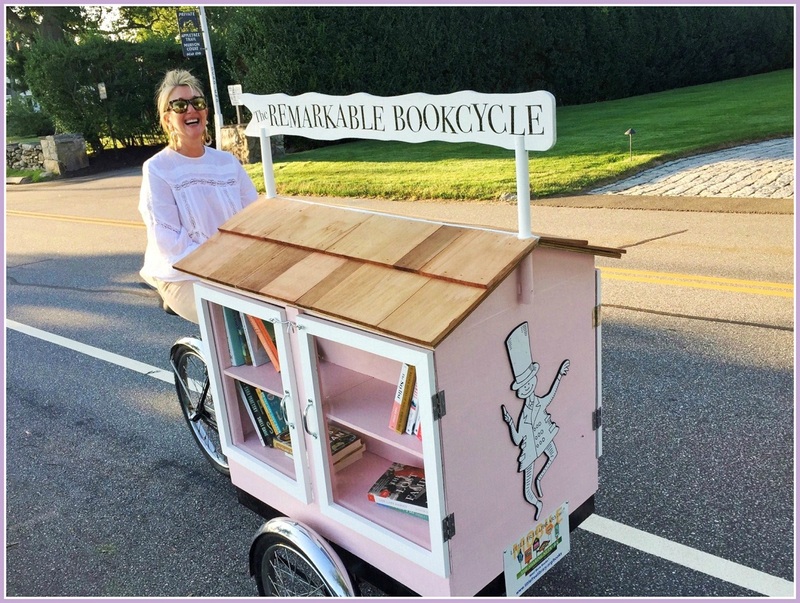 Wonderful idea, wonderful Remarkable Bookcycle, thank you Jane Green and all! Looking forward to seeing our latest and pinkest library and making donations. All the lovely responses are as enchanting as the reality of the undertaking. Thanks for posting the back story. How perfect that Miggs was involved. I hope I get to see this in the fall. And, for those who enjoy reading and would like a further trip down memory lane in connection with the Remarkable, please check out “The Love Letter” by Cathleen Schine (Staples ‘71). The story is built around a bookstore that is reminiscent of and was inspired by the Remarkable Book Shop. PS—a question for Miggs, if he should read this: do you know who designed the original logo? Thanks. Esther Kramer and Esta Burroughs live! Kudos and thanks to Jane Green for keeping the memory and spirit of the The Remarkable Bookshop alive. Esther would have been “charmed” by the appearance of The Remarkable Bookcycle. Jane’s project reflects perfectly Esther’s desire to keep people happy, well read, and entertained. Thanks to Miggs for the spot-on artistic visuals. The Bookcycle certainly embodies the sprit of – these – two Remarkable women his mother Esta and my mother Esther! The original drawing for the logo was done in the early 60s by none other than Edward Gorey. 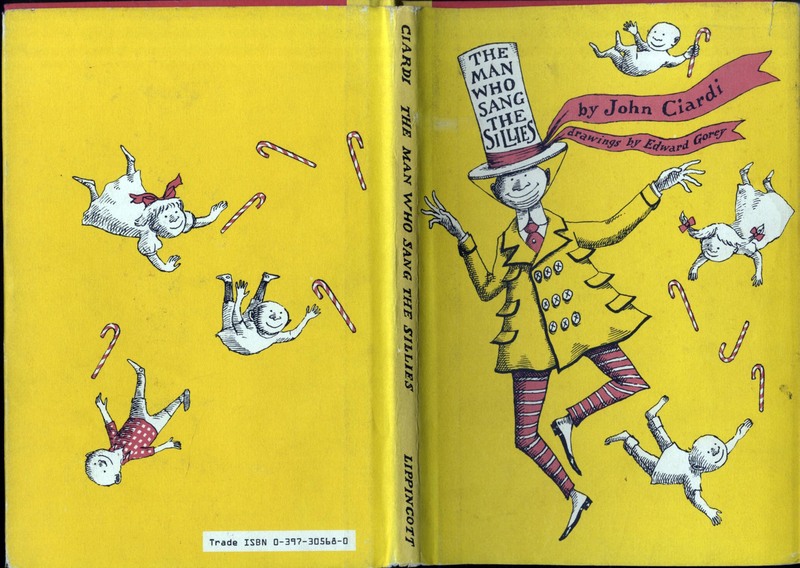 My mother saw the illustration in a book of poems by John Ciardi, The Man Who Sang the Sillies, and knew that she wanted to use the ribbon on the man’s hat for The Remarkable logo. My dad, ever the copyright lawyer, called Gorey and asked permission to adapt the image. Gorey was charmed and agreed. Wendy, thanks so much! This is a fascinating piece of Westport history. I will echo my mother in that my Grandmother Esther would have LOVED this. She’d have printed out the blog post, carried it in her purse and showed it to everyone in her path. And I mean everyone: the librarians she loved, her favorite servers at diners, and “Dear Joanne” (Woodward) who she lovingly greeted whenever we happened upon her in town. She would treasure this homage, as will I. Thank you on behalf of my family for this lovely tribute to my personal childhood fantasyland – the bookstore I’ll always be looking for. In this new renaissance of indies, I have hope that there’s some magic out there. So many 06880 posts offer reminiscences that bring a sweet trickle of tears. My intimate time in Westport, 1973-1984, and my orbital time, 1984-1999, were wonderful as was Westport. I so loved The Remarkable Bookshop, this post brought nearly a torrent! This story reaffirms that Westport is indeed a special place…and that Jane and Miggs are very special people. No place else can match it. We’re all so lucky to be here and to experience such small miracles every day. THIS IS AWESOME! The Remarkable Book Shop was a MAGICAL place. There were so many nooks and books, treasures and discoveries, it ignited imagination and knowledge, and always a flutter in my heart of what I would discover upon each visit. Oh the Westport that once was. 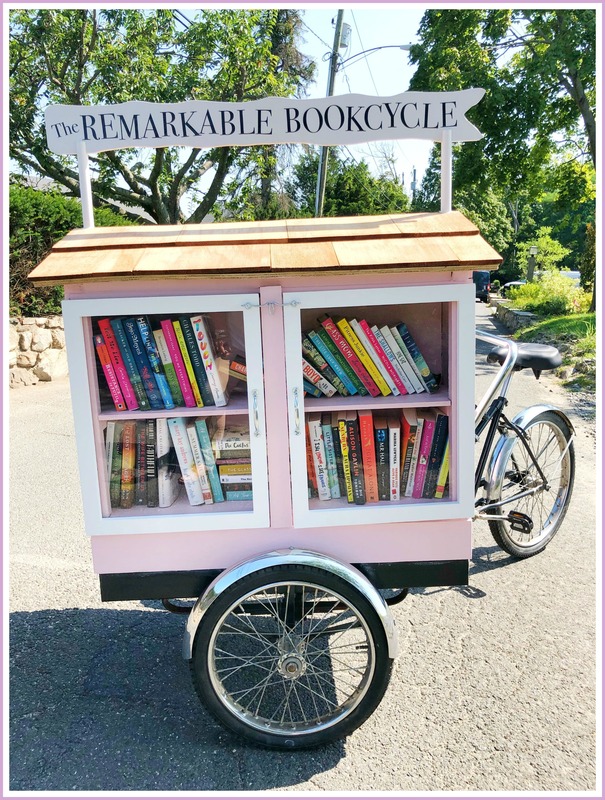 What a delight to see The Remarkable Book Cycle, can you pedal your way to California so I can load you up with some books! So great!!! Great story- there is also a free little library hut at the top of Wright Street. Great story, and thanks to Jane and Miggs for this inspired idea! I knew Esther and Sidney (yes, a terrific copyright lawyer who helped my parents) and Esta well, and this book cycle will be bringing so much joy to all the readers (and readers-to-be) in Westport! Hats off to Ms. Green for her efforts to rekindle the spirit that was the Remarkable Bookstore. It seems that a pent-up demand for that shop still exists and despite the fact that the original storefront (and record hunter section) remains available, one wonders why this hasn’t happened. Yes, the rent remains too damn high, but it seems to me that there is enough money flowing through Westport that someone would want to reopen the store and would likely be very successful.